Game 1: Rain or Shine vs. San Mig Coffee Preview - 2014 PBA Philippine Cup Finals - Balita Boss! Only the best teams reach the PBA Finals even if they’re not the top seeded in the elimination. The Rain or Shine Elasto Painters and the San Mig Super Coffee Mixers are set to meet in the 2014 PBA Philippine Cup Finals this February in a best-of-seven series. The number two seeded Rain or Shine booked the first Finals seat with a 4-1 win against the Petron Blaze Boosters in a best-of-7 semifinal series. The San Mig Super Coffee, led by James Yap’s 30 points and Peter June Simon’s 28 points, advanced to 2014 Philippine Cup Finals after beating top seeded Barangay Ginebra San Miguel in Game Seven of their Manila Clasico semifinal series. The San Mig Coffee was the fifth-best team after the elimination. The Game 7 between Ginebra and San Mig Coffee on Febraury 12 set a new Philippine basketball attendance record with 24,883 paying fans. Last year, the Elasto Painters won their only other finals meeting with the Mixers in Game seven of the 2012 PBA Governors’ Cup. The championship is the Rain or Shine franchise’s first crown in the PBA. During the elimination round, Rain or Shine swept the series 2-0 against San Mig Coffee. In their first meeting of the season, Painters beat Mixers on December 9, 86-83. 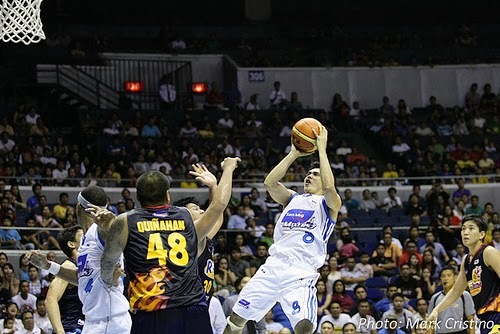 ‘Angas ng Tondo’ Paul Lee led the way with a career-high 26 points on 5-of-9 three-point shooting. ‘Coffee Prince’ Mark Barroca led the Mixers with 23 points followed by Simon with 18 points. The Rain or Shine were relentless come the second game in their elimination round, Raymond Almazan, the third overall pick in the 2013 draft, led the Painters to an amazing 101-77 win on December 29. Almazan finished the game with game high 17 points, 11 rebounds and two blocks. Yeng Guiao versus Tim Cone will be epic. The two are the most effective and most respected coaches patrolling the sidelines in the PBA today. This will be the second championship round meeting between the two multi-titled coaches. Guiao entered the PBA as a coach in year 1990. Cone debut in the bench to guide the players in 1989. Since starting his coaching job in the PBA in 1990, Guiao, a representative of the 2nd District of Pampanga, had won 6 titles with three different teams (Swift – 1992 Third Conference and 1993 Commissioners Cup, Red Bull – 2001 and 2002 Commissioners Cup and 2005-06 Fiesta Conference, and Rain or Shine – 2012 Govenors’ Cup). Guiao does not have All-Filipino crown yet and this year’s Philippine Cup finals might give him the elusive title. Meanwhile, Cone won 15 titles with Alaska and B-MEG/San Mig since joining the league as a coach (Alaska Aces – 1991 Third Conference, 1994, 1995, 1996, and 1997 Governors’ Cup, 1996, 1998 and 2000 All-Filipino, 1996 and 1998 Commissioner’s Cup, 2003 Invitational Cup, and 2007 and 2010 Fiesta Conference, and B-MEG/San Mig Coffee Mixers – 2012 Commissioner’s Cup and 2013 Governors’ Cup). Both coaches became a two-time Coach of the Year, Guiao in year 2001 and 2011-2012 season and Cone in year 1994 and 1996. Can Yeng Guiao find a way to finally nail his first All-Filipino crown or Tim Cone will get his 16th title and become the most titled coach in the PBA? Here are the top rookies to watch throughout the Finals. Who do you think will win Game 1 of the 2014 PBA Philippine Cup Finals: The Rain or Shine Elasto Painters or the San Mig Super Coffee Mixers? Can ‘Big Game James’ Yap, ‘Scoring Apostle’ PJ Simon, ‘Coffee Prince’ Mark Barroca and ‘Pinoy Sakuragi’ Marc Pingris carry the Mixers past the Painters or the ‘Extra Rice, Inc.’ duo Beau Belga and JR Quinahan ‘Angas ng Tondo’and Gilas Pilipinas Members Gabe Norwood and Jeff Chan of the Rain or Shine collectively outplay the entire San Mig Coffee? You can share your thoughts or prediction by leaving a comment below.